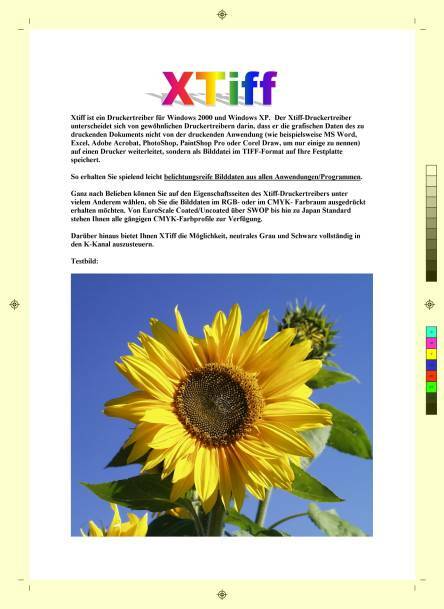 As EXTIF pro prints in an image file, the “Paper Format” refers to the dimensions of the area which would be occupied by this image when printed at a given resolution (in dpi = “Dots Per Inch”) on a page of physical sheet of paper. As you can see, most DIN formats have a corresponding "Extra“ and an “Extra Plus“ format. These two formats are wider by approximately one-finger-width crop margins than the corresponding normal DIN format. Later on, during the actual printing process, no printing device is sufficiently capable of precisely arranging and printing the paper with the exactness of a tenth of a millimeter, even if the paper exactly fulfills the norm, without these crop margins there will always remain, at least at one margin, an undesired white stripe on the sheet of paper, if the colored regions of the document reach the papers borders. In chapter ”Trimming” you will receive detailed information regarding the way in which the crop margins help avoiding this undesired white stripe. The provided image files can reach astonishing sizes when printed on large paper formats such as “A1” or “A0”. For this subject, please consult chapter “Huge files”. Later on, in chapter “Paper Format Sections”, you will find out how advanced users can define and access their own paper formats. 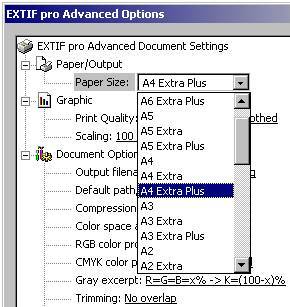 The suffix “Extra Plus” instructs EXTIF pro to automatically add crop margins, each with a width of 12,5 mm, including register crosses, crop marks, gray-scale wedge and color wedge to the original document. The register crosses are meant to serve as orientation marks in order to bring all four Cyan, Magenta, Yellow and Black exposure films into alignment. After the actual printing process, the crop marks will indicate where the paper is supposed to be cut. Property Trimming makes sense only when choosing an “Extra Plus” format. Otherwise, the local settings are totally irrelevant. The Paper Formats with suffix “Extra” (without “Plus”) are just as large as the ones with the suffix “Extra Plus”, but they are there in case you want to add the imprints onto the crop margins by yourself, using PC applications like “PageMaker” or “QuarkXPress”. As opposed to the “Extra Plus“ formats, EXTIF pro will therefore not convey crop margins with register crosses, crop marks and color wedges, to the “Extra” formats. As both formats don´t otherwise differ.